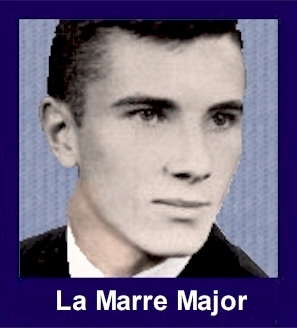 The 35th Infantry Regiment Association salutes our fallen brother, PFC La Marre Arthur Major, who died in the service of his country on March 12th, 1967 in Kontum Province, Vietnam. The cause of death was listed as Small Arms/AW. At the time of his death La Marre was 20 years of age. He was from Benton Harbor, Michigan. La Marre is honored on the Vietnam Veterans Memorial at Panel 16E, Line 69. The decorations earned by PFC La Marre Arthur Major include: the Combat Infantryman Badge, the Bronze Star with V, the Purple Heart, the National Defense Service Medal, the Vietnam Service Medal, the Vietnam Campaign Medal and the Vietnam Cross of Gallantry with Palm Unit Citation. He also loved to play cards. Sometimes we would play all night long. Best of all he was a loyal friend and I cannot think of a time that he betrayed me or did something mean. I miss LaMarre and think of him often. I have a tracing from the memorial in DC. It has been a long time since he died and longer still since we hung out together. The parents of a 20 year-old Benton Harbor area solider received word early today that their son was killed recently in combat in Vietnam. Dead is Pfc. LaMarre A Major,20, son of Mr and Mrs Arthur Major, Benton Harbor. Young Major would have celebrated his 21st birthday March 29. Drafted July 5 1966, Major arrived in Vietnam December 4 1966 and was a grenadier. His parents had planned to mail him a birthday cake today. Major was a 1964 graduate of Benton Harbor high school and had attended St John's Catholic school. He later attended Lake Michigan College a year and had been working as an artist at the time he was drafted. Besides his parents, survivors include a sister, Mrs Carole Wilson of Chicago; and his paternal grandmother, Mrs Joseph P Morel of Benton Harbor. LaMarre is buried in Crystal Springs Cemetery, Benton Harbor.